Breton's comments to "the readers of Comoedia" were later published in the "After Dada" section of Breton's Three Dada Manifestos. Tzara later explained the problems he had with the Congress (and the Dada movement in France) in a letter to Christian Zervos dated February 16, 1937. In the letter Tzara complained about a "newspaper release" that referred to him as a "publicity hungry imposter" which "occurred only a few days after the official invitation to participate in the Committee of said Congress" - presumably a reference to Breton's comments in Comoedia. (RD304). He also made reference to a performance of his play Le Coeur a gaz which took place at the Galerie Montaigne in Paris on June 10, 1921 as part of the Salon Dada Exposition Internationale exhibition which ran from June 6 to June 30, 1921. Although the performance of Tzara's play was meant to be the high point of the program of Dada performances, the audience walked out soon after it started. (PJ355/356) Tzara asked in his letter to Zervos, "Is it not likely that this demonstration, the hostility of which was directed... against the second part of the program, the performance of my play Le Coeur a gaz, was not the expression of a principle, but of a personal vengeance directed against myself?" (RD305). "We are still living under the reign of logic... Under the pretence of civilization and progress, we have managed to banish from the mind everything that may rightly or wrongly be termed superstition, or fancy; forbidden is any kind of search for truth which is not in conformance with accepted practices. It was, apparently, by pure chance that a part of our mental world which we pretended not to be concerned with any longer - and, in my opinion by far the most important part - has been brought back to light. For this we must give thanks to the discoveries of Sigmund Freud... Freud very rightly brought his critical faculties to bear upon the dream. It is, in fact, inadmissible that this considerable portion of psychic activity... has still today been so grossly neglected.... I believe in the future resolution of these two states, dream and reality, which are seemingly so contradictory, into a kind of absolute reality, a surreality, if one may so speak. It is in quest of this surreality that I am going, certain not to find it but too unmindful of my death not to calculate to some slight degree the joys of its possession." "SURREALISM, n. Psychic automatism in its pure state, by which one proposes to express -- verbally, by means of the written word, or in any other manner -- the actual functioning of thought. Thought, in the absence of any control exercised by reason, exempt from any aesthetic or moral concern. Surrealism is based on the belief in the superior reality of certain forms of previously neglected associations, in the omnipotence of dream, in the disinterested play of thought. It tends to ruin once and for all other psychic mechanisms and to substitute itself for them in solving all the principal problems of life." 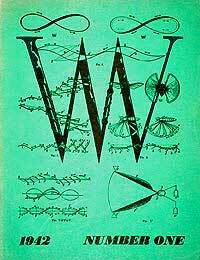 The first issue of VVV featured a cover by Max Ernst and contributions from Robert Motherwell, André Masson, Kurt Seligmann, Gordon Onslow Ford and Charles Henri Ford, among others. David Hare was designated the editor of the magazine. Matta had originally suggested that Robert Motherwell be the editor and Motherwell had written to William Carlos Williams suggesting that he become the American literary editor of the magazine. In his letter to Williams, Motherwell noted the importance of automatism to his own work: "Now I have taken a partisan stand, in the creative sense that Surrealist automatism is the basis of my painting." (SS214) By the time the first issue of VVV was published Motherwell had resigned. Motherwell, who in 1951 would publish an anthology of Dada painters and poets, also provided an explanation of the title of Breton's magazine. VVV was meant to be a new letter of the alphabet. For the first issue of VVV Breton promised a new manifesto but instead provided a "Prolegomena" - in which he railed against Salvador Dalí, Aragon and Paul Éluard and those "who follow either the Bible or Lenin" as well as Surrealist imposters ("Tomorrow it will be Matta's turn to be imitated.") He then asked "Can society exist without a social myth?" Around the same time that Breton and Matta were attempting to create a new myth, the concept of myth was also being explored by some of the New York artists who would later be referred to as Abstract Expressionists, particularly Mark Rothko and Adolph Gottlieb. Both artists were classified as Surrealists in Sidney Janis' book Abstract and Surrealist Art, when it was published in November 1944. (SS351) According to Janis, Rothko had specifically requested to be included in Surrealist section of book. Although Gottlieb and Rothko borrowed from Surrealism during the early 1940s, they were never particularly close to its founder on a social level. 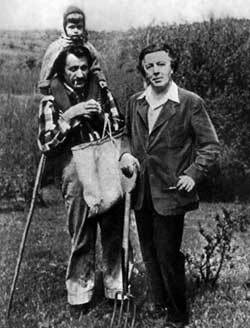 Breton spoke hardly any English and tended to socialize with the other European exiled Surrealists. Breton was also primarily a literary figure rather than an artist. Matta, who had arrived in the U.S. a couple of years prior to Breton, socialized more with the New York artists than Breton and, being a visual artist himself, exerted more of an influence on their work. Of the artists already living in New York at the time of the Surrealist invasion it was probably Arshile Gorky who was the closest to Breton on a personal level. Matta would also befriend Gorky but with ultimately tragic consequences. Arshile Gorky had emigrated to the U.S. in February 1920 after surviving the Armenian Genocide (see April 1915). Barnett Newman would later refer to Gorky as "the white-haired boy of Breton and the Surrealists" (HH557) It was largely through Breton's efforts that Gorky got his first dealer - Julian Levy - and his first solo show in New York for which Breton wrote the preface to the catalogue. 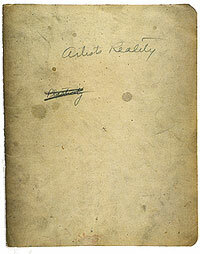 Breton's preface ("The Eye-Spring: Arshile Gorky") would also be included in the second edition of Breton's book Surrealism and Painting published in 1945. Gorky did not actually meet Breton until early 1944. Jeanne Reynal, a friend of Gorky's wife, wanted to meet Breton herself so she asked Isamu Noguchi to help arrange a dinner that included herself, Gorky, Gorky's wife Mougouch and Breton. Jeanne and Mougouch could speak French and acted as translators for Breton and Gorky during the dinner. Mougouch later recalled that Gorky "had found a soul mate" in Breton. According to Mougouch, "Breton promised to see Gorky's work in the next day or so" and "Gorky and I danced all the way home." (HH450) They invited Breton to Gorky's Union Square studio for dinner and a chance to look at Gorky's work. Gorky had, of course, been aware of Surrealism for a considerable period of time prior to meeting Breton. Gorky's first dealer, Julien Levy, later recalled that when Levy's book, Surrealism, was published in 1936, "he [Gorky] straightaway read it in the back room of my gallery and soon borrowed it to take home." 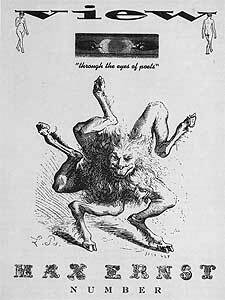 (MA284) Initially Levy was reticent to take on Gorky.